Custom Ceremonies for Your Wedding. As an ordained interfaith minister I am available to officiate weddings. If you choose me as your wedding officiant, you are assured of a ceremony that reflects your desires for a ceremony that takes into primary consideration the desires of the couple and also works around the often times varied spiritual/religious orientations of family and friends who will be attending the ceremony. I’ve been performing weddings since the late 1990ies. I’ve officiated weddings in churches, on the beach, under the canopy of trees, in private settings, parks and in hospitals. My specialty is to create a service that is unique for each person whose life we are honoring and a comfort to those left behind. As an interfaith minister, I am adept at constructing a ceremony using the language, concepts, music, poetry, and other elements that genuinely reflect the personality, interests, loves and delights of the beloved human being, family member, friend, spouse, or other who has exited their body. Death is the one thing we know that will happen to us at some point. It is a natural thing, even when the circumstances are tragic and sad. 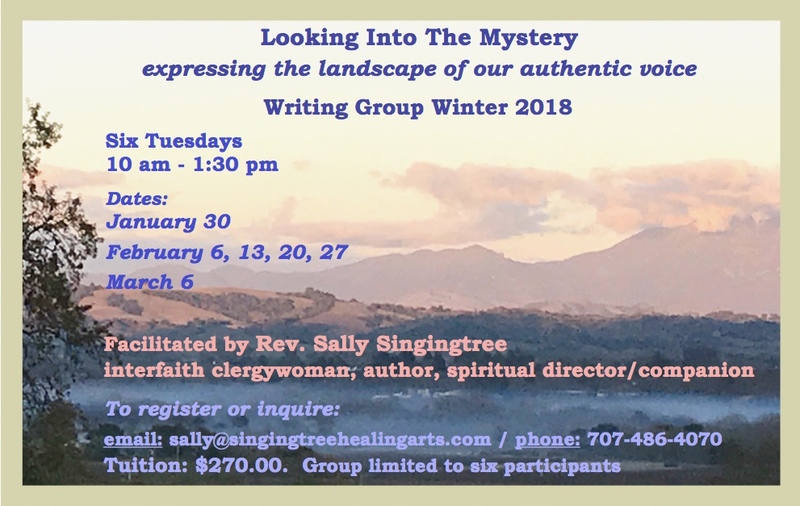 Write with me in one of my “Looking Into the Mystery” writing groups. Together we’ll use words to plumb the mysteries of our ongoing relationship with the spiritual dimension as evidenced by our own life experiences and seeking. Beginners and Experienced writers are welcome. Call or email to find out about dates of next groups.